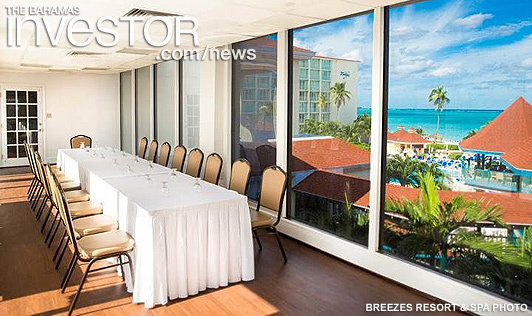 Breezes Resort and Spa Bahamas, an all-inclusive resort on Nassau's Cable Beach, has finished a makeover of its six existing meeting spaces and added a new 490 sq ft event space, which holds up to 50 people and boasts floor-to-ceiling glass windows overlooking the ocean. Breezes Resort & Spa – Bahamas, an all-inclusive resort on Nassau’s Cable Beach, just finished a makeover of its six existing meeting spaces and added a new 490 square foot event space, Panorama Gallery, which holds a maximum of 50 people and boasts floor-to ceiling glass windows and doors overlooking the ocean. All of Breezes Bahamas’ meeting, conference and ballroom spaces received new chairs, carpets, ceilings, and enhanced solid wooden doors. The Seabreeze Ballroom, the hotel’s most thoroughly revamped and expansive space at 3,840 square feet, holds anywhere from 200 to 500 people in configurations ranging from classroom and theatre to banquet and reception. Breezes’ second largest event space, the Ocean View Terrace (2,100 square feet), is prime for banquets and receptions of up to 200 people. The indoor Ocean View Suite, which is surrounded on three sides by the Ocean View Terrace, accommodates up to 150 people in 1,550 square feet of indoor event space. In addition a refreshing of furniture, the Ocean View Suite received new drapes. The Hibiscus Room (440 square feet), the Ponciana Room (420 square feet), and the Yellow Elder Room (380 square feet), which each hold a maximum of 40 people, are perfect for smaller breakout meeting sessions. Business or pleasure, no venue offers better value for groups than Breezes Resort & Spa – Bahamas. Minutes from the airport, but miles from everyday life, Nassau’s first and only Super-Inclusive® resort offers a convenient beachfront location for meetings, conventions, exhibitions, seminars, tradeshows, corporate retreats and more. Travelers looking to plan a 2016 getaway can save 30 to 50 percent on stays now through December 31, 2016, during Breezes Bahamas’ Leap Year Sale. Book by February 29. Rates start at just $116 per person, per night, based on double occupancy. Guests can also enjoy a complimentary room upgrade during the travel periods of February 28 – March 5 and August 16 – September 30. Visit Breezes.com. Around 1,000 delegates from 120 countries attended the Caribbean Hotel and Tourism Association's Marketplace conference held at Atlantis Paradise Island last week. Watch a recap of the event here. The fourth LPGA Pure Silk Classic teed off this week at the One&Only Ocean Club Golf Course this week. The tournament will be shown live on the Golf Channel, which reaches 220 million homes in the US, offering enormous exposure and promotional opportunity for The Bahamas.